It’s the holiday season – time for family and friends, good cheer, and PRESENTS! Plus, we also understand that budgets are tight these days, so in the spirit of the holiday season, we’re offering discount MIX09 conference passes at $795 USD (that’s over 40% off the full price) to the first 200 people to register. To take advantage of this offer, go to registration and select the "Register for the event using an RSVP Code" option. Enter the RSVP code MIXspecial2 to receive your discounted conference pass. This is a real, live, bona fide MIX09 conference pass that allows you access to keynotes, sessions, the party, the food, the lounges and much more! Act now – this limited release of discounted passes is sure to sell out FAST. I was recently asked to take on a new role in addition to the work I’ve been doing on Dynamics evangelism. Developer and Platform Evangelism (DPE), the group I’m in at Microsoft, is the one that runs the annual MIX conference. MIX is Microsoft’s flagship conference for web developers, designers and business professionals. Volker Will and I will be thinking about how to make the experience at MIX a great one for startups and venture capitalists. I’m still not sure how I got pulled in to this. I guess I should have ducked instead of raising my hand. Even though most of the folks in DPE are based in Redmond, I’m actually incredibly lucky to be based in Silicon Valley… startup country. So that might also have a little to do with it. The reality is that I’m incredibly excited to be working on this. Yes, excited and little scared. Volker and I have been given a blank whiteboard to fill. We have some ideas but we’re still in brainstorming mode. MIX is still months away so this gives us a bit of time to think about it. That also gives you an opportunity to let us know what we should be doing. 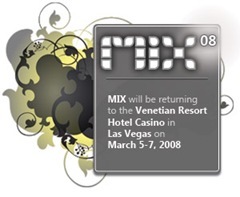 BTW, MIX returns to the Venetian Hotel in Las Vegas on March 5-7, 2008. Go write that in your planner, I’ll wait. What would it take to get you on stage to tell the world why you’re using the Microsoft platform? One thing we’re pretty sure we’d like to do is to showcase startups that are building their businesses (in one way or another) on the Microsoft platform. We’re working through the details for how we do that. Do you have any ideas? If you’re at a startup would you want to showcase your company at MIX? MIX has become a premier conference for us and as a result generates tons of top stories in both print and online media. The startups that we showcase would get the full benefit of that visibility. Is that enough though? What more would you expect from Microsoft in return for helping us with this. Think big here. I’m not sure I can get you a weekend at the Gates estate but short of that; what sorts of things would you, as a startup, ask of Microsoft? If you’re not at a startup, what sorts of startups would you like to see? As a startup why would you attend a conference? You are likely on a short leash as to which conferences you can attend. Besides having to think about the obvious costs related to registration, travel, etc you also have to consider the time away from the keyboard cutting code (or web design, product plans, term sheets, etc). With that in mind what would it take to get you to MIX? What would you be looking for at the conference? What’s the ultimate benefit you’re looking for? Just as in the last 2 MIX’s, we’ll have the technical/design side nailed. What I’d like to know is what are all the other things you look for in a conference? Is it networking with other startups? Are you looking to line up your next round of funding? Are you looking for your next big idea? What can we do to make the MIX conference experience a great one? As a venture capitalist why would you attend a conference? As a VC you’re probably not thinking much about the costs. On the other hand you’re certainly limited in the time you can take away from your managing your portfolio. So what would it take to get you to MIX? What would you be looking for? Would you be looking to spot the the trend-lines to the next big thing? How would you do that? Are you looking to add the next startup to your portfolio? Is it networking with other VC’s? How can we facilitate these sorts of things? If you have ideas about any of this I would love to hear from you. Go ahead and post a comment below. Or if you prefer not to post your ideas or thoughts publicly feel free to drop me a note.